This post was originally published on 16 April 2015. 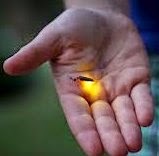 President Jane did a presentation at the October meeting on fireflies so the information on fireflies has been reposted for anyone who may be interested in learning more about them. It wasn't until this summer that I saw Fireflies on the Coffs Coast for the first time. This prompted a quick bit of research to learn more about them. Fireflies are indeed not flies, but beetles and are found in the wetter regions of Australia, favouring rainforests and mangroves. The blinking light, which comes from segments on the underside of the tip of the abdomen is created by a chemical process. This is triggered when the beetle opens small apertures to allow air in. The chemicals react to the presence of oxygen with a blaze of light, but are soon exhausted. They quickly recharge however, in time for the next burst, thereby creating the flashing effect. According to Thala Beach Nature Reserve's website the males aren't that much different from human males - 'in many respects fireflies and humans share a fundamental trait – the males are the main flashers, who cruise at night in search of a female'. Males are the main flashers, emitting a series of controlled flashes just after dusk as part of the mating sequence. Females also flash however, their flash is in response to a male's flashing. With enormous eyes and a visor to keep his attention focused, he is on the lookout for an answering blink which indicates a suitably impressed, but flightless female. Firefly larvae and pupae are also slightly luminous. 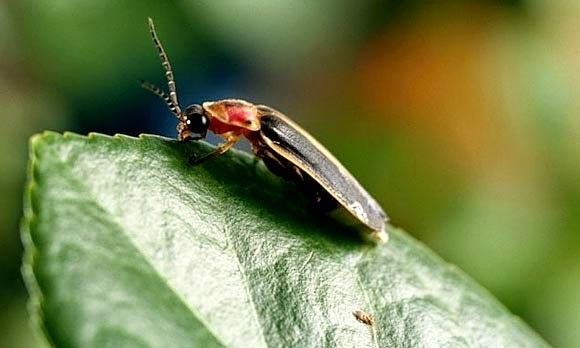 During the larvae stage, fireflies will hibernate over winter, burrowing underground or hiding under the bark of trees. The larvae will then emerge in spring to feast. 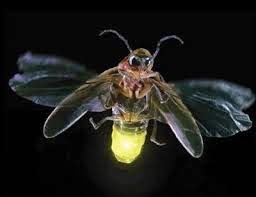 Interestingly, the flash produced by fireflies is a 'cold light', having no ultraviolet or infrared frequencies. This chemically sourced light, which can be yellow, green or pale-red, projects wavelengths from 510 to 670 nanometres. Adults cannot feed as they don't have any mouth parts (like some other beetles), but their larvae prey on other insects' larvae, cutworms, slugs and small land snails. They paralyse their supper using secretions produced by a pair of acinose glands at the anterior end of the alimentary canal and injected through the perforate mandibles - this means that the prey is digested extraorally and the liquified tissues are imbibed. Their short lives add a certain urgency to their flashy courting behaviour. Spotted quite a few in my Emerald Beach garden on the evening of 8/12/18. Was ready to try photographing them the next night but they were a no show. These ones had a green flash light to high (in the tops of palm trees) to make out much more. Passionfruit Vine is NOT very Passionate?